Casita Elena at Villa Casa Terramar is close to everything and yet a world away, nestled at the end of a cobblestone street, just 4 blocks from the beach and the center of the charming village of Sayulita. Casita Elena is a unique unit tucked on the side of the property, very private. It is a 1 bedroom 1 bath casita with one Queen bed, and one Individual bed and can accommodate 3 guests. The best part of this casita is the open kitchen and living area housed under a palapa roof surrounded by lush tropical foliage. You are completely in your own tropical world when you stay here. The property features a large beautiful sapphire pool, 2 sundecks, one upper and one lower; providing plenty of lounging and chilling space and a gas BBQ grill all surrounded by lush tropical landscaping. Many guests spend a least one day during their visit just enjoying the pool and tranquility of the Villa. Fully equipped kitchen with everything you need; including coffee maker, microwave, toaster, utensils, dishes etc. Purified drinking and cooking water supplied. Bacteriacida is also included for washing fresh fruit and vegetables. Housekeeping service is provided once per week. Your unit will be cleaned and supplied with fresh towels and linens. Free secure wireless internet service is available throughout the property. Even works poolside. Digital safe for your valuables. Beach towels are provided. Umbrella, beach chairs, boogie boards and coolers are available for you to use as well. Please use the contact form to get in touch with any questions and to request a reservation. We look forward to welcoming you to Sayulita! For larger groups, all three casitas can be rented together, providing 3 bedrooms, 3 baths for up to 8 guests. Please view our Casitas page for more information, pricing and photos. Casita Elena is so incredibly comfortable. It was more than we ever expected. Safe, had everything we needed, plus lots of extras we didn't think about but totally enjoyed (like an umbrella and chairs for the beach). And, Beth was exceptional! Attentive and responsive, and thoughtful about what we might need or enjoy. 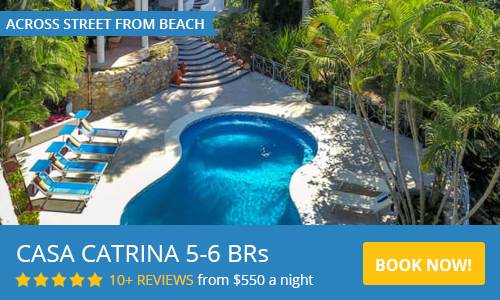 If you are headed to Sayulita, definitely stay here! Loved our experience and can't wait to go back! Beth, the owner is phenomenal and the space is wonderful. Everything is very clean and the house is well furnished with everything you would need. We had stayed in Sayulita before in another property with a palapa, and it was so much noisier. The Casita Elena bedroom blocks out a great deal of the noise from chickens, dogs, and music, which is charming but not always easy to sleep to! So it is the best of both worlds, with open living space and closed sleeping space. The hike up the hill is not for the faint of heart, so consider renting a golf cart to get around in! We had a wonderful time and can’t wait to go back. Muchas Gracias Beth! We enjoyed our stay at Casita Elena. Our unit was clean and as expected. It was a nice blend of open air with the bedroom enclosed to offer privacy and protection from bugs at night. There was some road construction during our stay which made getting to and from the unit interesting and would have been difficult for someone with limited mobility. It is a hike up but manageable. The pool area was private and peaceful. We enjoyed our time and would stay again. Casita Elena in Sayulita is a combination of charming and unique architectural design, a great location, and excellent communication. Beth really takes her hosting job seriously, providing the little things that make staying such a pleasure: a warm greeting, excellent furnishings and linens, lots of information about the area delivered personally and in her guidebook, some food basics to make doing a bit of cooking easy......even a cold beer in the fridge upon arrival. She was always eager to answer our questions and help us in any way she could. The apartment has tremendous character reflecting the creative culture of Sayulita. We loved the outdoor open-air kitchen/dining/living room with its comfortable furnishings and partial palapa roof. The view across the town made the climb up the hill easily worth it. Said simply, our five-star experience was the result of Beth’s fabulous taste and attention to detail and her sincere commitment to seeing that we had that experience. Casita Elena is simply lovely and in my opinion the best place to stay in Sayulita. I have been to Sayulita many times and this trip was one of the best. The Casita is nestled into a lush hillside, just far enough away from the bustling town center to have a peaceful retreat from all the action, but close enough to walk in under 10 minutes. I loved being amongst local residents, including the neighboring rooster and his brood! The casita is very private and comfortable, the open air living space adds an extra tropical touch. Beth is friendly, accommodating, available, great with local tips and tricks. The house manager, Corey was super quick to respond to any needs. My favorite part of the house was the deep pool and sun deck. The space is large enough to share with other Villa guests without feeling like you are intruding on someone's space. The BBQ grill and hammock are just icing on top of an already fantastic spot. I highly recommend staying here the next time you are in Sayulita! Have fun! Super clean, well equipped, can't wait to return! Casita Elena was the best. Super clean, great communication and recommendations. Location away from the bustle of town, but a super quick walk to get to the center. Also just the things you need in the well stocked kitchen. The pool was such a luxury too. We can't wait to return! Thank you Beth! Casita Elena was great - accurate compared to the pictures, lots of kitchenware to cook our meals with, great pool and deck. Beth accommodated our late departure time and we were able to spend the morning on the beach, and promptly responded to our message about more drinking water. It was a bit noisy at night (a holiday weekend, mostly) but honestly, you'll get that anywhere in Sayulita. At other places I've stayed in Sayulita, I couldn't sleep without earplugs and at Casita Elena, I didn't need them. The open air living room is fantastic and between the plants and shade covers, there's lots of privacy. Would definitely stay again! Our stay at Beth's Casita Elena at Villa Terramar was exactly what we were hoping for: small kitchen for meal prep, indoor open air private lounge, two beds in secure bedroom, ceiling fans, shared pool and hammock space. The accommodation was perfect for my mother and I and we enjoyed meeting the other guests throughout the week. Terramar is about a 10 min walk into town and to the beach, which we preferred to get away from the craziness of the Easter weekend. If you are booking this suite I highly recommend the upper units (if you have 4-6 people) since the views from the top are incredible. We had a wonderful stay and will definitely be back! The accommodations were maintained well and the staff was very friendly and responsive with any issues we had. The pool was very refreshing anytime of day, but especially so after the little hike uphill to the house. It was nice to be off of the main street but within a five to ten minute walk of it all. We loved it! We loved staying at Casita Elena. We spent hours in the outdoor kitchen / living area reading and listening to the sounds of birds. The way the house is arranged you can get lots of privacy, we barely ran into other guests even though there were a few other folks in the house. Pool was excellent for cooling off during the hot days! Seasonal rates are in US Dollars Weekly stays prefered, Saturday to Saturday. Please inquire for shorter stays during low season. Weekly rentals only during Holidays.